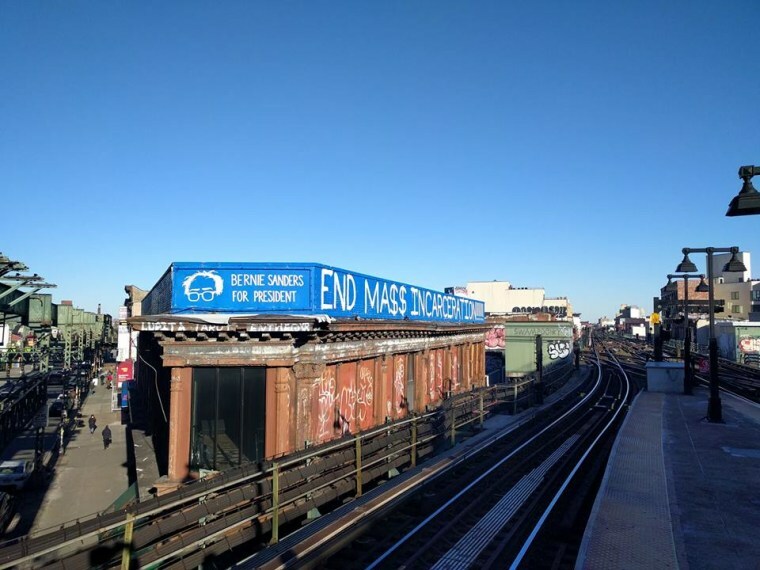 Market Hotel, as seen from the Myrtle Ave JMZ platform. Market Hotel, Bushwick's beloved DIY venue that rose from the ashes of a 2010 shutdown late last year, is closed again temporarily after NYPD conducted a raid that found the venue was warehousing alcohol while not under protection by a permit. Market Hotel's managers are currently in the process of obtaining a liquor license for the space's new bar, which is a long process. In the meantime, the venue had been applying for one-day beer and wine permits for each show. On Friday October 7, the night of the Titus Andronicus show, their application for a beer and wine permit was denied because the New York State Liquor Authority was finally reviewing their application for the permanent permit. Despite the fact that Market accepted the night's show would be dry, local NYPD officers swooped in for a surprise checkup and found Market's stored alcohol before the operations manager had a chance to remove it. All scheduled shows were moved to other venues like Villain and Brooklyn Night Bazaar. It's troubling news for the neighborhood. The venue — which in addition to showcasing some of the best underground rock, electronic, and hip-hop acts, also hosts many community-oriented events and meetings — has made an effort to be transparent and above-the-board about its operations since it reopened. On top of that, there have been only five noise complaints regarding Market Hotel in all of 2016, compared to the more than 300 calls about Club Republic, the bar across the street, as The Observer reported. Finally pending for our full liquor license! While waiting strictly no alcohol can be in bldg. To be prudent, relocating all shows for now. In a Facebook post last night Ric Leichtung, founder of AdHoc, the organization that books Market's shows, wrote, "We've had complete transparency and of course had no intent to sell without proper permits, which makes this feel like entrapment...It's all very disappointing because mutual respect between law enforcement and the community is something we really need right now." Market Hotel's Facebook page also posted a nine-point explainer of the situation, noting, "Market Hotel's mission statement calls on us to find common ground between nightlife, culture, and community service. Market Hotel enjoys a good relationship with our neighbors and the greater community. We have not been subject to complaints from our community." Leichtung added: "Market will be back soon."